My name is Naomi Mulholland and it is a privilege for me, as Headteacher, to show you that my staff and I are committed to providing a happy, a safe inclusive environment where everyone is significant and respected for their differences and achievements. As a Catholic School we strongly believe that education is a partnership between home, school, parish and community. We are dedicated to developing children who achieve personally, academically, socially and emotionally throughout their time at our school. This underlines our school’s commitment to create learners for the future. We strive to make learning fun and to provide an education that develops the whole child academically, socially and emotionally. 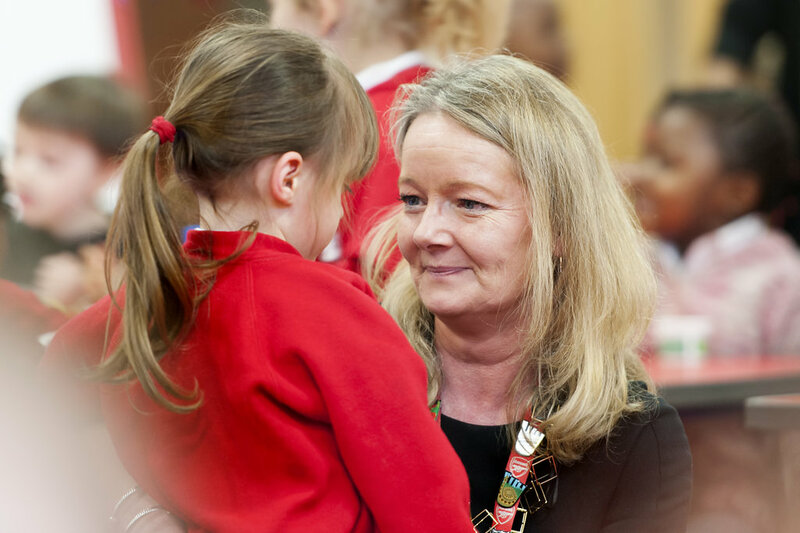 We recognise that every child is special and has their own unique contributions to make. We inspire each other to learn, grow, enjoy and be happy. We focus our energies on ensuring that all children aim for excellence and are able to achieve the very best that they can. We create a strong self-belief, so that all are prepared to meet the demands of a changing world and make positive contributions. I feel truly privileged to lead such a wonderful school and to have the opportunity of ensuring that each child receives the best possible education in their formative years. Our website is only a glimpse of what we feel makes St Scholastica’s Catholic Primary distinctive. The best way for you to appreciate what we can offer your child is to experience our school first hand. I do hope you will visit us to meet our children and staff and to experience life at our unique school. Please make an appointment via the school office. The original St. Scholastica’s Church stood at this same location, but faced the opposite direction. The church was bombed in 1940 and partially repaired to make it serviceable. The original school was situated in the Church parish hall, which was located at the rear of the church, close to where the school keeper’s house now stands. The school hall was divided into two areas for infants and juniors, however, the demand for a larger school was growing. It was decided that the Alms houses next to the church would be demolished and a new church and school be built on the site. Whist the building works took place the school moved temporarily to Millfields School in Hilsea Street. The new school was officially opened by Bishop Guazzelli in October 1974. Through the years the school once again outgrew its building. In 2006 the school won a bid for an extension and refurbishment of the existing building, and by Autumn 2009 the extension and refurbishment was complete. It is now an attractive, spacious building, comprising of a large Foundation Stage section with two outdoor play areas, Year 1 also has an outdoor activity area and all classrooms have been extended and have a wet area. In addition there is a large computer suite, a kitchen/parents’ room, small chapel/prayer room, spacious library, and multi-purpose hall. The administrative block has a welcoming entrance with attractive displays of the children’s work.